Students - We have snow again! Here south of Buffalo, NY where I live, it has been a snow-free couple of weeks. And now the snow is back. Today I am thinking about all of you who live in snow-free places, wishing I could send you some snow (but not too much) to play with. Do you have a wish for someone else? Is there something you have that you would like to share with others? If yes, then you might enjoy writing about it. What better way to begin the new year than with a wish for a friend? Today's poem does have a bit of rhyme and a bit of meter. What do you notice about the syllables in this poem? What do you notice about the rhyme? If you ever feel stuck getting started with your own writing, you might find a poem with a simple rhyme and syllable count - such as this one - and try writing with the same number of syllables per line or with the same rhyme scheme. Teachers and Adult Readers - For those of you who might not know, I also keep a Poem Farm Facebook Page. This page is full of regular links to poems I love as well as poetry news I find. If you choose to "like" it, please click on the arrow to "get notifications" if you would like to see the posts in your feed. In publishing news, I am excited to share that I have signed a contract with Crown/Random House for a picture book currently titled ALL I KNOW. No date yet, but lots of happiness over here! At this time of year, we have the fun of peeking at some 2014 favorites lists. Don't miss the 2014 Nerdy Awards for Poetry and Novels and Verse and the 2014 Cybils Poetry Finalists. Many congratulations to one and all. Tricia is hosting this first Poetry Friday of 2015 over at The Miss Rumphius Effect. Stop by and gobble up all of the wonderful offerings from poetry friends near and far. Happy 2015 to you and yours! Many wishes for a year full of poems and favorite new words! Amy, I love your idea of writing about a wish for a friend! And although I hate driving in snow, an inch or two would make the yard prettier. Happy New Year! Lovely poem and great news, Amy! I love the idea of a wish poem for a friend. I wish I could receive the snow. In Virginia, we have gotten barely any this winter. I miss it! I am thinking about writing a wish poem now. Thank you for the inspiration! I'm so excited to be joining my first Poetry Friday. This is terrific! We have snow, and cold, since Christmas! Love your wish, but I usually only wish for the ski resorts. less down here on the flat. Congrats for all those forthcoming books. I know I'll love them, Amy! A splendid wish poem, Amy. I know a couple of children at my house who would delight in a box or two of snow. :) Congrats on your recent good news! I love snow Amy and we have so little here in Michigan right now. What a great idea! Your box of snow makes me think about the " can of sunshine " I bought at a tourist shop in Florida when I was a little. I thought it was so funny to send it home to my friend in MI. Amy that poem is snow much fun! It reminds me of one Christmas Eve when we were in West Falls and there was plenty of snow there, but no snow in Fairport where we were headed home to. My dad thought it wasn't right for our daughter, his granddaughter, to not have snow Christmas morning so he loaded up my sister's pickup truck with snow and she proceeded to drive it to Fairport and dump it on our front lawn. Needless to say, our daughter was thrilled and we had some very confused neighbors that Christmas;) Congratulations on your new book! I hope to see you again! your week, sealed with clear tape." 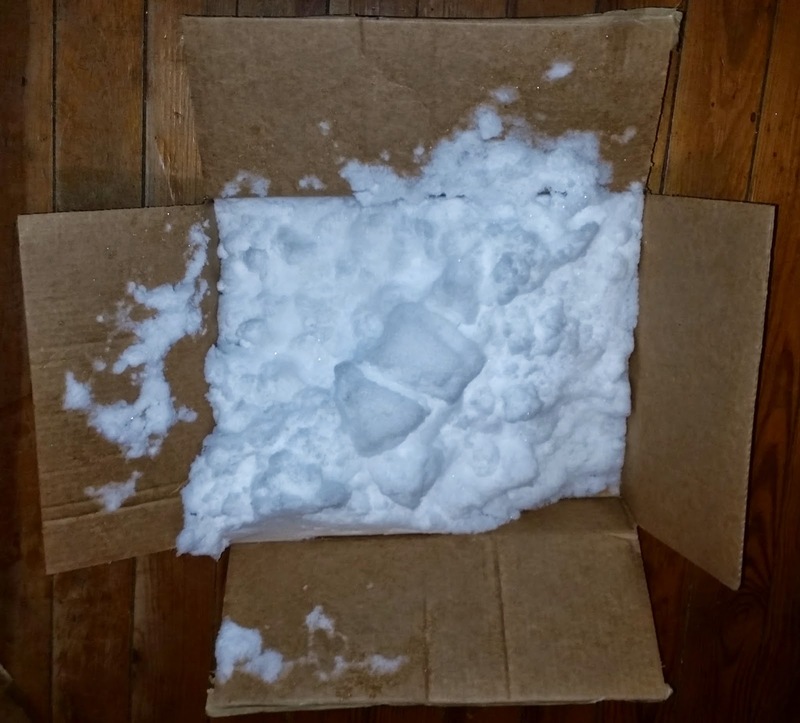 What a delight to think of receiving a box of snow! May I trade you a box of wrinkled wrapping and trailing ribbons? Congratulations - new books of yours is welcome news indeed. What a lovely idea to write a poem-wish. A box of snow would be welcome now - we have been snow-less too long. Congratulations on your book deal! Celebrate! Congrats on the book deal! What a great way to start the new year! Your poem reminds me of me as a kid, but with leaves. I wanted to bag up our leaves and take them to the trailer park where there were no trees so that the kids there would be able to jump in a big pile of dusty fall fun! Congratulations Amy! What a lovely idea - posting snow to a friend. It's reminding me to thoroughly enjoy all the little blessings I have here with the ones right in my house; like hugs and smiles and snowflakes. Sweet. I would take a box full, but only a box full! Your poem reminds me of eating snow ice cream at my grandmother's house. A bowl of snow scraped from the fence rail, a drop of vanilla, and a dab of milk. Congrats on the upcoming books! Oh, Amy - First, CONGRATS on the new contract and all those upcoming books! What a lovely poem! As a former Minnesotan transplanted to California many years ago, this poem really worked for me. Congratulations on your publishing success. That is great news. Have a Happy New Year and thanks for sharing all your wonderful poems. Amy, your delightful poem is accompanied by a equally delightful box of snow. Clever! I am so pleased for you and your successes this year. I remember when I was little growing up in Syracuse being so caught up in play surrounding snow-snow forts, snowmen, tracking. You bring back those memories to me. 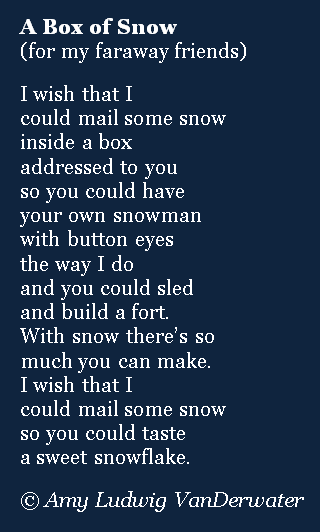 Love the idea of boxing up snow and sending it to a friend--that's such a great kid's perspective. Congrats on your new book! Oh I would love a bit of that snow, dear Amy. It's been hot and humid back here in Singapore. :) Great teaching strategies included here as well. Congrats on all the publishing news! So proud of you. You inspire me so much.